What is it like living with celiac disease? The challenge of beginning such a big lifestyle change, and staying free of gluten is a big one. The learning curve is steep, and hidden gluten is in many foods. Don't worry if you make a mistake. It will set back your healing by a few weeks, but you will still heal. It happens to all of us. When you first go on the diet, you are most likely dealing with a sore and irritated intestine. You may have some vitamin and mineral deficiencies already. Your stomach could be sore and touchy as well. Your intestines are probably not absorbing nutrients well at all. So you have to be careful what you eat for at least the first 3-6 months. I take a good natural multivitamin daily. I think it is very important to do so since I already had vitamin deficiencies and most gluten free products are not vitamin fortified like the gluten products are. For example, B12 is digested and absorbed in the last part of the small intestine. When the area is damaged, the intestine can only absorb a tiny amount of the B12 you need. Unless you are getting B12 shots from the doctor, a sublingual (under the tongue) B12 vitamin could be important to prevent anemia. The methylcobalamin form is the one I use, as it is more effective. If you have intestinal damage, it is likely you cannot digest milk products. So it makes sense to go dairy free as well for the first few months, to give your intestines time to heal. Once they have had time to heal enough to have the tips of the villi back, your body can produce lactase again, which will allow you to digest the lactose (milk sugar). In the meantime, there are substitutes like rice milk, soy milk, Vance's Dari Free (potato based), almond milk and others available. They can be used with gluten free cereal, or in most recipes. Soy versions of cream cheese and hard cheese, or rice cheese products can be used in recipes as well. Many gluten sensitive people have found that milk gives them problems even once the intestine is healed. 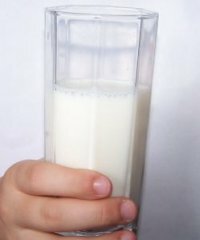 The protein in milk, which is called casein, can also cause an immune reaction. If you are intolerant of casein, you will find your digestion getting uncomfortable again. Once you have an immune reaction, the casein will be something to avoid, like gluten. Unless you have an antibody test for casein, you probably won't know if you can tolerate it until you have healed enough to digest lactose. So after you feel that the villi have healed, you can do a trial of milk products for a few days, and see if you can tolerate it. If you are uncomfortable, you might want to wait a few months and try again. One option is to get tested for casein by Entero Lab. Another option after you've healed a bit is to try Lactaid. If you are just missing the lactase from the tips of the villi, you may be fine with dairy products as long as you use the Lactaid. If you try this and you are uncomfortable, or you start bloating again, then wait a few months. Give it one more try, and if you still react badly, even with Lactaid, then try avoiding casein and see if you feel better.